Even though she has been in ill health for quite some time, the recent passing of Laurel Kane has shocked and sorrowed the Route 66 community. On a personal level, a lesson that we have all learned at least once was reinforced, again. For the Route 66 community, her loss calls to our attention, again, a very serious issue that is not easily addressed. However, the very future of Route 66 as a living, breathing time capsule with its own unique culture depends on us, as a community, finding a solution. As happens far to often, our trip to Edwardsville and the Miles of Possibilities Conference this past October was bound within the confines of a fairly rigid schedule. The evening before we left, I was contracted to speak before a tour group. On Sunday morning, the day we left, I was to meet with a tour group in Winslow. The date for our return to Kingman was also set resultant of another contracted appearance. In between were several appointments. 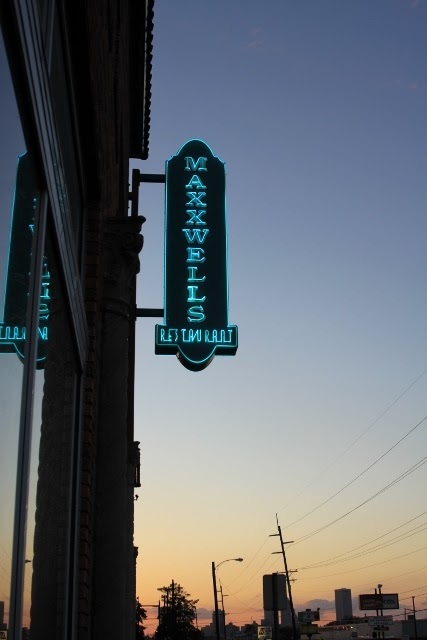 A Tulsa sunset at the Campbell Hotel. As a result, the flexibility that allowed for long visits with friends on the road was severely restricted. Still, plans were set to have dinner with Laurel Kane, as well as Rhys Martin, and his charming wife Samantha at Maxwell’s in the Campbell Hotel. Laurel canceled at the last minute resultant of not feeling well, and a dialysis appointment scheduled for early the following morning. On the return trip, we stopped at Afton Station, but Laurel was absent that day. The schedule didn’t allow for another stop in Tulsa, so I called Laurel when we got home to Kingman, and into December there was some correspondence as she provided input for the next book. The moral in this story is an ancient one. Time is the one finite item that we each have. Not one of us has control over the amount of time allocated. However, we each have control over how we choose to spend or invest this precious resource. Use it wisely. Learn to balance the need to earn a living with what is needed to ensure that it is a life worth living, a life that is enjoyed, a life that enriches the lives of others. Lastly, keep in mind one simple fact, none of us are getting out of this alive. However, while we are here, lets fill that life with friends and family, laughter and adventure. Last summer we embarked on a new odyssey, one that was a bit unnerving. For the first time in more than thirty years of marriage, I wasn’t bringing home a steady check or two. On one hand being set free from a rigid structure of schedules, an employers soul crushing lack of respect, and mind numbing boredom has been liberating and invigorating. However, now that the schedule is being set by me, it has been discovered that I can be a very harsh taskmaster. Laurel Kane will be sorely missed by all who knew her, and by the Route 66 community. Her loss, as with that of Gary Turner, highlights an impending crisis. The historic bridges that enhance the sense of time travel on Route 66 are imperiled. A few will be lost. A few will be saved. A few will be re-purposed. Landmarks face a similar fate. We will loose a few, and we will gain some new ones. However, what really makes a Route 66 journey memorable, what really sets a road trip on the double six apart from any other in the world is the people. It is the passion, the spirit, the enthusiasm, the warmth, the generosity, and the hospitality of the people that you meet on the road, and the people who open businesses and that welcome travelers with open arms. The passing of Laurel Kane highlights a very real threat to the future of Route 66 as a community. As the song by George Jones so aptly asks, who is going to fill their shoes? There are glimmers of hope in Rhys and Samantha Martin, Jessica and Cameron Mueller, Katie and Chris Robleski. Still, the question remains, will Route 66 as a vibrant community survive into its centennial and beyond? Very well written, sir. Time marches on, past all of us. It's vital that we take time for ourselves and for others, for they are the truly irreplaceable parts of the Mother Road and in our greater lives. Beautiful article Jim, written from the heart. Live for today and make it count. We should do an audio archive of peoples memories while they are still with us, maybe I will try and record a few during my trip. Our bodies pass away but our memories can live forever.